People on the left need to come up with ways to protect themselves first and foremost because it’s not going to be the state. At first glance, Bolsonaro’s overwhelming victory—he won by over 10 million votes out of nearly 115 million cast in the second round of the election on Sunday—looks like the most recent win for the global far right, which has rapidly gained power in the United States and Europe. 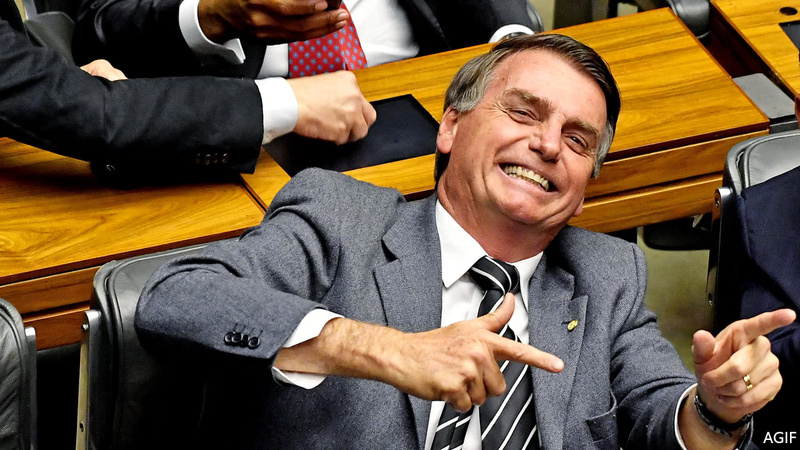 But while Bolsonaro’s rise has been cheered by the far right, and Bolsonaro has been compared to Donald Trump, the broader global context of Bolsonaro’s win (naturally) doesn’t tell the whole story. Wendi Muse is a doctoral candidate at New York University who studies the history of leftist movements in Brazil and Portuguese-speaking countries in Africa during the latter half of the 20th century. As someone who followed the election with very little knowledge of Brazilian history, Muse’s Twitter account has been an invaluable resource for me in providing context about why Bolsonaro is so dangerous and why the comparisons to Donald Trump aren’t that accurate. those who engage in this anti-establishment reading of the vote are literally copy/pasting US 2016 election framing onto brazil’s situation and it is not. the. same. thing. “As someone who studies Brazilian history, particularly the era of military dictatorship, I feel like I’ve been witnessing my research come to life,” she wrote for the New Internationalist magazine on October 30. Splinter spoke with Muse yesterday by phone about Bolsonaro, the comparisons to Trump, how the United States helped facilitate the rise of the Brazilian right, and what his win means for the future of Brazil and South America. Who is Jair Bolsonaro, and why is he so dangerous? He’s a former member of the military himself, during [Brazil’s two-decade] military dictatorship. He’s been in office as a representative for multiple parties over the last 19 years or so, and he hasn’t really done anything in office. One of the things he did do while he was in office, though, was to vote against measures to give women equal wages [to men]. He was the only representative who voted against this bit of legislation. He became popular in 2013 during protests co-opted by the right, and inspired this movement that was very right-wing but had a bit of a libertarian aspect as well, which was funded by wealthy Brazilians and American libertarians. I would [also] say that he was way more direct in his language and pushing for legislation that would be prejudicial to people of color. And I think there was a large degree of anger and resentment [from] white Brazilians. These sorts of underlying tensions helped propel him further into power, not to mention he has an incredibly strong social media campaign and presence. How have American libertarians been involved? The main one is Atlas [Network], a libertarian think tank that operates throughout South America. They help consult for what we would consider a Tea Party equivalent in Brazil. Why, and how, do you think Bolsonaro won at this particular moment in time in Brazil? It goes back to the co-opting of left-wing grievances and an angry, predominantly white upper class. If you’re wealthy in Brazil, you’re probably white; if you’re poor, you can be of any color but you’re probably black or brown. So it began with a lot of that. And I think another thing that explains it, especially when you consider the extension [of Bolsonaro’s support] among people of color and poor people, it’s the influence of a right-wing media. If you look at Brazilian media, they’re all run by the same five or six families, and those corporations exert control over everything. It’s astounding when you watch the news in Brazil. Imagine Fox on every channel. Talking to friends of mine in the northeast of Brazil—which is a PT [Workers’ Party, Brazil’s center-left party] stronghold [and] went for PT in multiple presidential elections including this one—the answer they’d get from people who you would normally not expect to vote for Bolsonaro is that it was about safety. I would also say religious conservatism is a huge thing in Brazil that contributed to his win. This is a thing that’s always been in Brazil but has become more intense over time. Over the past few years you’ve seen a growth of this right-wing prosperity gospel style of Evangelical worship has been dominant. What kind of coalition did he win with? The people who didn’t vote for Bolsonaro were predominantly dark skinned black people, the poorest, people who were the least educated, and people who were worshippers of Afro-Brazilian religions which have been under threat. Literally the most downtrodden people in the country, the most oppressed groups, didn’t vote for him. But everyone else, including mixed people of color, people who are middle class, working class, all religious groups, men, women—all went for Bolsonaro in overwhelming numbers. Some American media outlets have characterized Bolsonaro as this kind of populist and even compared him to Donald Trump, as has been the case with pretty much every far-right leader who’s risen in the last couple of years. Do you think those comparisons are accurate at all? It’s somewhat accurate if you’re just talking about the growth of the right wing around the world. I think in general we’ve seen a wave worldwide of “populism,” but the reason I’m frustrated by these takes is that they ignore that the growth of the right predates Trump. It’s this false retelling of history in which Trump is the beginning and the end, and I have a huge problem with that, because it’s superimposed America’s history onto those histories. So in that respect, I think they have something in common, but beyond that and racist rhetoric, they don’t have much in common. 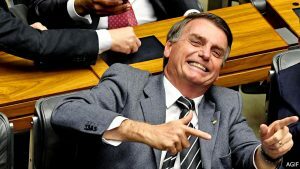 [Bolsonaro] wasn’t a good military member and got kicked out because of some things he did, but I think having that association with the military [differentiates him from Trump]. And his entire potential cabinet is made up of agro-business tycoons and military members. His VP is a former military general. These are all leftover military generals from the dictatorship. In the U.S., we’ve never had a dictatorship. You can argue we’ve had authoritarianism, and Trump is certainly a part of that, but it’s not to the same degree that we’ve had a total shutdown of Congress. If someone like Bolsonaro and the generals are in power and exercising it to the same degree that it was during the dictatorship, the rest of the world will not be able to do anything and places like the United States will not do anything, because they know it’ll help them economically. Bolsonaro seems to be virulently anti-communist and that puts him squarely at odds with Nicolás Maduro and Venezuela, and they’ve been threatened and sanctioned by the Trump administration. What do you think that Bolsonaro’s election means for Venezuela? Do you think there’s the possibility of a war? Yes, I do. And I think it would have a lot of support, oddly, from Bolsonaro voters. The reason I say this is that if you look at the states that went for him in overwhelming numbers, like 72, 73 percent, were the states that border Venezuela in the northwest. People who live along the border and people in general who are conservative would be very in favor of a war with Venezuela, because of the anti-communist sentiment, but also this rhetoric against people taking advantage of state programs and benefits. Much like you see in the U.S. about immigrants taking our jobs and welfare, even though it’s completely inaccurate, in Brazil there’s similar rhetoric around Venezuelan immigrants. What’s interesting too is that even in the 2013 protests, you would see language where they would literally insult members of PT and even left-leaning people, even if loosely so, they would refer to them as “Venezuelans.” So it was already used as a slur towards the left. Something you’ve been talking about that’s been interesting to me is the role of the U.S. in propping up the coup in 2016. How much do you think that has led to the rise of Bolsonaro and the far-right in Brazil? One of the things that happened under [former President Barack] Obama is that he was spying on Dilma Rousseff when she was president. A lot of that spying had to do with what was happening with Petrobras, which is the Brazilian state-owned oil company, and the U.S. has always been angling for privatization of Petrobras, even under the earlier dictatorship, but that push has always fueled people like Bolsonaro in terms of having support from incredibly wealthy people in Brazil and then the right-leaning press outside of Brazil. The Wall Street Journal, arguably even the New York Times and The Guardian, the way that they’ve been discussing what’s been going on with the investigations and potential privatizations as favorable. Another thing I want to add is that, even from the time period I study, the right talks to one another. We talk about left solidarity and left internationalism, but there is a right-wing internationalism. These governments and right-wing groups learn from one another, they study one another. And then you have figures like Steve Bannon who are involved in the Brazilian election. A lot of Bolsonaro’s success is over-attributed to Steve Bannon, but you can’t deny that he had a hand in this too. You can’t look at the relationships between Bannon and Bolsonaro’s family and say there’s no connection there. Your work as an academic has focused on the left opposition to authoritarian regimes in Brazil and Portuguese-speaking countries in Africa. What can the left in present-day Brazil and the United States learn from those movements? I think the first thing is to not be afraid to act and not to be satisfied with just rhetoric. I’m not saying people need to start a war or anything, but I think people need to become creative in their harm reduction. 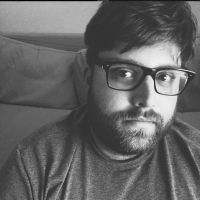 It has to go beyond just tweeting and go into a space of educating others, understanding how to speak to people about their rights, and ways to influence people who are voting directly against their interests for someone like Bolsonaro who’s going to harm them. It involves a layer of creativity that has to go beyond just social media. But I’d also say that we as leftists and internationalists in general have to recapture the space of social media. If you look at YouTube, Twitter, Facebook, Instagram, all of it is dominated by right wingers and, in many cases, literal Nazis. We need to come up with creative ways to explain in short form what leftism is and what it means to act and vote in a way that supports your rights and your needs being met by the state. On the level of militancy, I think people sadly just need to prepare themselves for violence en masse. If you’re looking at what just happened in the U.S., I’m sitting here freaking out at all of this constant right-wing violence. I’m not saying everyone on the left needs to go out and get a gun, but people on the left need to come up with ways to protect themselves first and foremost because it’s not going to be the state. The state is not going to protect you. The state right now, in the U.S. and Brazil, is the enemy, and we have to think of ways beyond just rhetoric to protect ourselves.